Going above what the world offers is a sign of self-empowerment. A good place to lean on is to lean on yourself. 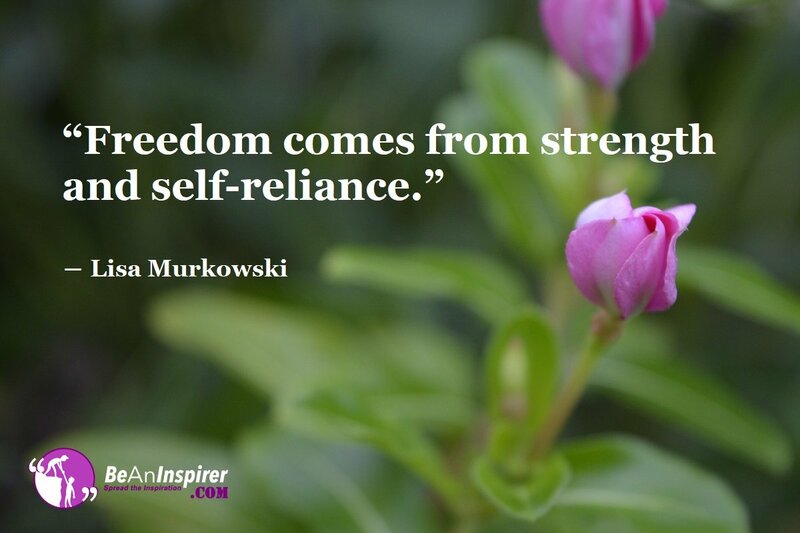 Your belief in yourself, leads you to being self-sufficient. Amongst the trillions of species in this world, it is a human being who has the ability to completely be free. A human being can truly be free from the dependence of the various conditions of the world. All that which is needed for anyone to live, progress and prosper is already in us. Yet we humans constantly look outside. We believe that something outside will give us freedom and make us happy. Our relationship with the world is intricately woven and supportive. Nature supports us throughout our lives. We get the perfect conditions to live from the very beginning of our inception. Our body temperature is a managed to perfection. We get the right quality of air to breathe. We constantly receive food and nourishment from the environment. These are the ways nature supports each living creature. How Do We Participate In The World? Our participation with the world happens through our positive presence. As well as contributing and sharing our unique skills and talents. This relationship of interdependence is how we all function in life. But this is not mean that we get dependent on the world. We must not forget our inherent strength and capabilities. Going above what the world offers is surely a powerful capacity within us. Innately we humans have the capacity to adapt, adjust and overcome challenges. This capacity is our inherent strength. It lifts us helping to go beyond the dependence on others and be free. To be able to cope up with any circumstances with the inherent qualities within us is being free. Let’s see an example. If you are in a cold environment, you have the capacity to make yourself warm. You would ensure to protect yourself. As well as make sure that you have everything that you need to sustain through the cold environment. This capacity in you helps you to meet and overcome any challenge you are presented with. You are not victimised by the environment. Rather you show that you can cope up and rise above. The objects of the world are very attractive. Every moment we are thrown into making a choice. If we only choose to pick up all that which is attractive, it leads us to be dependent on those attractive things. Whereas if we choose to only pick up those things that are right for us, we show perfect self-control. This is how we exercise the power of being self-sufficient. So what are the things that attract you in the world? How do you plan to go above them? Know that sharing your thoughts could help others. So feel free to share your comments below and let us know.